Starting Tuesday, September 8, student work must be saved to the Z drive. Work not saved to the Z drive will not be accessible on other computers by the student. Student computer files must be saved to the Z drive starting Tuesday, September 8. 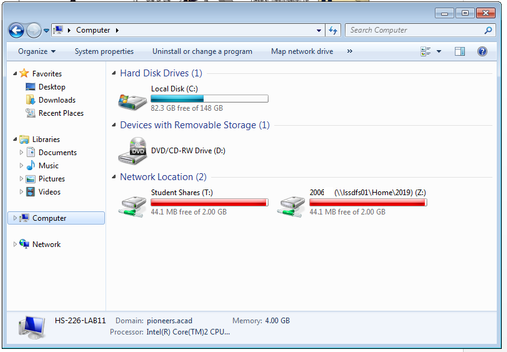 By changing this setting, the Information Technology department can significantly reduce the amount of time it takes for students to log on to the computers and disk space requirements on the network drive. The only way to save a file to the server so it is accessible anywhere is by saving it to the Z drive, which is as simple as choosing File -> Save As and picking the Z drive. Student work saved to the desktop will only be available on that specific computer's desktop. Student files saved to the My Documents folder, will only be available on that specific computer's My Documents folder. This is especially important on thin clients because students will lose if not saved to the Z drive since nothing is stored locally on these machines. All students are strongly encouraged to save their work to the Z drive. Student can receive help or clarification from their teacher or by contacting the IT department.